Vision is a web-based application suite developed to work with the award winning Splicecom SelectVoice IP Business Telephone System. Delivering a wealth of relevant, business critical reports and a depth of realtime information, Vision enables you to monitor the performance of both your company and workforce. As SelectVoice runs as a single system, no matter how many sites it is distributed across or how many home based, remote or mobile employees are connected, Vision is able to collect information on every Department and every individual - wherever they may be. Real-time information can be delivered to department heads and managers totally independent of their location: via their Tablet or PC web browser. Technical Support or Sales Order Processing, Customer Service or Accounts, Help Desk or Sales, whatever area of the business needs to be focused on, Vision has the answers. This allows issues to be identified and rectified before they become business-impacting problems, whilst resources can be optimised at all times for maximum productivity. Vision also provides the real-time information needed to ensure operations run smoothly. Are service levels being met on the Help Desk? How many abandoned caller have yet to be called back? Do customers have to wait in a queue longer than necessary? The are the type of questions which can be effortlessly answered by Vision. And as for the workforce, Vision works hard for them too, by offering far greater managed flexibility over the way they choose to handle their telephone calls when they're not in the office. The business telephone system holds vital information on how an organisation is performing, but how do you get it? Vision Reports provides an in-depth company wide view of how a business is performing, when it's wanted, where it's wanted and how it's wanted. All reports can be accessed through a web browser from anywhere at any time and printed or exported if required. Key reports can be scheduled by time and date and delivered to individuals or groups by email, whilst custom-reporting groups can also be constructed. Vision Reports is broken down into five main areas; Call Performance Profiles, Cost Analysis, Capacity Planning, Call Centre and Call logs. Vision allows you to restrict which Report Categories a manager or administrator can access. This is configured by selecting Vision Manager and ticking which Report Categories that particular manager or administratoris allowed to see, such as Cost Analysis, Call performance, Capacity Planning. Vision Record seamlessly integrates the automatic and/or manual Call Recordings produced by SelectVoice into Vision Reports, allowing them to be easily managed, searched for and played-back when ever necessary. Details of the Call Recording - including the ability to "click & play" - are included with the full call logging record of each call. Providing fully integrated Call Recording as a standard feature is one of SelectVoice's many strengths. Utilised for training purposes, to meet regulatory requirements or simply to keep a record of telephone conversations and transactions. Call Recording is delivered independently of handset type; IP, analogue or GSM/4G mobile. SelectVoice's integrated Call Recording application allows each leg of a call to be recorded separately, no matter how many times it is transferred. Vision Record then allows each 'individual leg' of a transferred call to be displayed in Vision Reports, where they are grouped together. This makes it extremely simple to just "click & play" and so listen to an entire call, regardless of how many people the call has been transferred to. And as Music-on-Hold isn't recorded on a transferred call either, there's no wasted recording space or time. The provision of call recording as an integrated application within SelectVoice's, managed through Vision Record and Vision Reports, delivers a sophisticated, flexible and easy to use solution. Offering full AES encryption and DVD Archiving/Restoration Vision Record is a considerably more cost-effective and efficient solution than that delivered by 'bolting-on' expensive 3rd Party recorders. 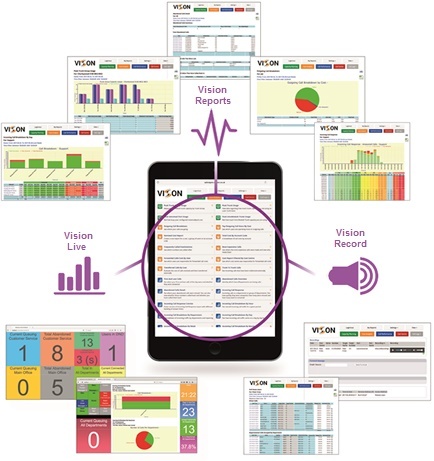 Delivering real time information on business performance to those that need it, Vision Live allows potential issues to be identified and resolved before they can impact operations. Vision Live provides the information that enables companies to optimise their resources for maximum productivity, so facilitating a smooth running operation. In addition, configurable thresholds can be set for Warnings and Alarms, on individual variables. These thresholds can be set to "Greater Than" or "Less Than", with a user definable count or time setting causing the panel to flash or play a sound once the threshold has been exceeded. The colours used to indicate the Warning and Alarm states are user definable, ideal for alerting any dips in service levels. Vision Live allows "the information behind the information" to be accessed by clicking on a panel to drill down further, so allowing an immediate investigation and/or response to any abnormal occurrence. Vision Call Centre helps businesses to meet and beat the service level expectations of their customers, whilst at the same time, increasing employee productivity and reducing operational costs. Developed to deliver a single seamless solution with SelectVoice platforms, Vision Call Centre combines advanced call routing with state-of-the-art reporting and management to optimise every aspect of your inbound call centre operation.